Papaver Somniferum Poppy Seeds Queens. Papaver Somniferum poppies, alternatively named Breadseed poppies, are fantastic plants which are used in gardens around the world. Quick growing and incredibly easy to look after you can quickly fill borders with these wonderful plants, either in mass or as part of a grander scheme, to add much needed color and vibrancy. And by following a few tips on where to plant Breadseed poppy seeds you can ensure that these plants achieve the best results that they possible can. Papaver somniferum poppies are best suited to a sunny spot rather than shady aspects. While they will grow in slightly dappled areas they will not thrive and flower to the best of their abilities, often looking slightly weedy and sad instead. For this reason it is best to plant or sow Papaver somniferum seeds in an area where they receive a lot of sun to help them grow strong and produce a large number of flowers. Areas of the garden where morning and midday sun reach are best, though late afternoon sunny aspects are also a great location. And by placing species of this beautiful poppy family in a full sun position you can not only ensure that buds grow quickly before opening, but that poppy seed heads ripen and dry quickly too. While many poppy species, especially California poppies, are perfect for containers, Papaver somniferum species don’t readily go into pots easily. They will happily grow in such as situation if planted and kept in the right aspect. However, due to their tall height and sometimes leggy appearance, they are not ideal for window boxes or hanging baskets. Large containers and pots can work well as long as you plant a number of foliage and flowers around the bases to disguise the stems. When it comes to flower borders, Papaver somniferum varieties are the perfect addition. Particularly in sunny borders they will do especially well, rising several feet into the air before opening their gorgeous flowers to attract wildlife and fill the garden with color. Plant Papaver somniferum poppy seeds in the mid to back of a flower border depending on the height of the individual specimen as they can grow rather tall and will look out of place if grown at the front of a display. Within a flower border it is also nice to have several groups of similar poppies placed at intervals throughout the bed, adding important cohesion to a planting scheme and drawing the eyes of visitors along the display. Papaver somniferum poppy seeds are very easy to grow, and given the right aspect and setting they will become a much loved member of your garden. Lasting just one growing season, they will grow quickly, enabling the plant to make as many flowers as quickly as possible to fill a garden with color. Meanwhile, with so many color variants available you will be able to find the perfect Papaver somniferum poppy seed variety for any color scheme. And whether you start with one plant or 20, you’re passion for poppies will quickly grow. 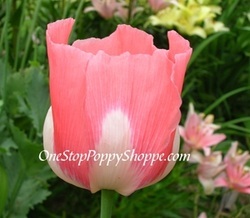 For buying poppy seeds online visit One Stop Poppy Shoppe for more than 75 varieties of these wonderful annual and perennial plants.